Thank you for being a member of our Kewadin Casinos Northern Rewards Club. We hope you enjoy the new benefits of this new service and take advantage of the complimentary services and points you have on your Club card. Win-Loss Statements are available to all carded players for tax purposes. It’s all yours just for using your FREE Northern Rewards Club card today! 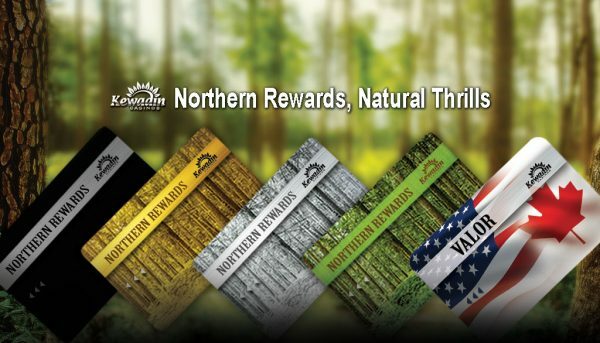 Kewadin’s tiered Northern Rewards Club has a two point system. The two sets of points accumulate simultaneously while serving separate purposes within the club. Qualifications for all four tiers are based on accumulated tier points over a rolling six-month period. Tier upgrades will happen every month and patrons will be notified when they upgrade to Gold or Black tier status. At the end of a six-month period, all patrons will be reevaluated and placed in the correct tier based on earned points at that time. Tier points are based on a six-month rolling calendar. Black and Gold card upgrades will be notified by mail. Silver upgrades can check their status at the Northern Rewards booth. 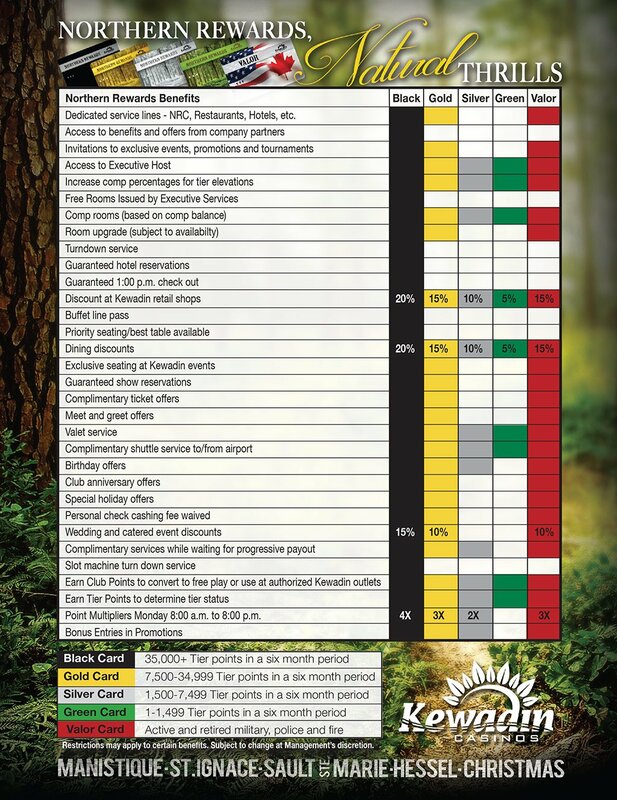 Here are links to view the tiered players club benefits and to download a printable version. To request a win-loss statement for tax purposes, please submit a request for win-loss statement form, or call 1.800.KEWADIN ext. 54993. For your protection, we have established these terms of service. The Northern Rewards Club cards are non-transferable and may be cancelled, altered, or revoked by Kewadin Casinos at any time without notice. Gaming is not permitted for persons under the age of 19. Please remember when you are checking your Northern Rewards Card balance or cashing in any of your points, you will need a valid form of identification. For account inquiries or information concerning our Northern Rewards Club, please call 1.800.KEWADIN and ask for the Northern Rewards Club Booth.